GREETS REPUBLICANS - Barbara Bush, wife of Vice President George Bush, greets participants in a Ridge for Congress rally Monday at the Sheraton Inn, West Middlesex. 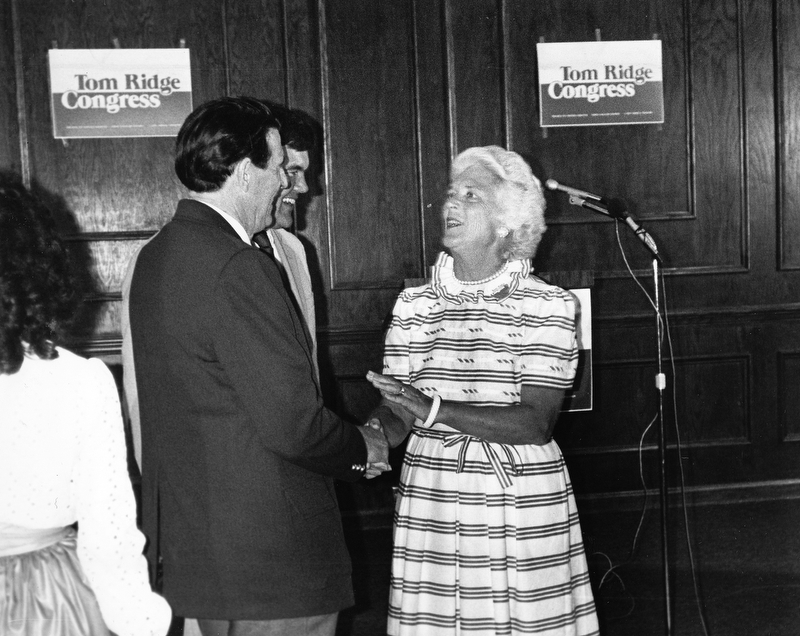 Republicans Tom Ridge of Erie, candidate for the 21st District, is visible to her left. Mrs. Bush also took part in the centennial anniversary celebration of a Sharpsville church built by her great-great-grandmother, Chloe Holbrook Pierce. Article written by Harold Gwin, Vindicator Sharon Bureau. Unknown date. "Barbara Bush 9:45 a.m. today (Tues.) Panella Penn today"